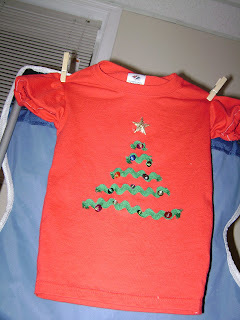 I didn't copy this exactly, but I did get the general idea from Small Fry and Co. She did a Christmas tree with ric-rac on a white onesie for her new little baby. I thought this was just a tad too girly to do on a onesie for John, but it would look great on Maddy right?! They dont make onesies in monster sizes for Madeline of course, but I figured a T-shirt would work fine. Of course Joanns didnt have any small enough, and I wanted to use my 50% coupon, so I settled for a Youth Small and decided to cut it down and make it a little more feminine looking. 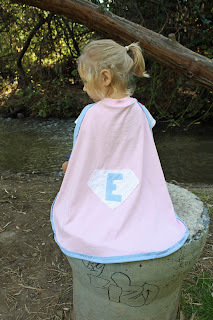 Small Fry and Co hand sewed her ric-rac on, and said it came out crooked because of that. 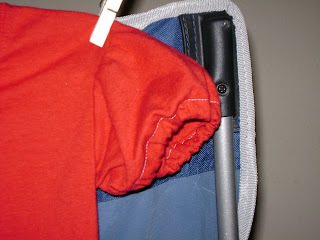 I tried machine sewing and it still ended up a little crooked. Also, I should have finished the ends of the ric-rac with No-Fray or something, but I thought maybe a bit of fraying would look like a cool tree. It doesn't. 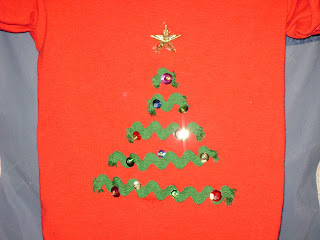 I used sequins instead of buttons, one because the colorful buttons were three times as much as a pack of mult-size sequins. And then I would also have to buy a star button, which would have been another $2 or so. (They didnt come singularly, in a pack of like 4 I think - I already had the gold star in my stash of supplies, but I had to hot glue it on.) The other reason for the sequins is that I thought Maddy would like the shininess more. She did. She loved to rub her hands up and down it all day long, and as a result almost all the sequins fell off. I intended for the sleeves to be higher up, at the top of the arm like a normal shirt. I just didnt take off enough at the top when I took in the sides. But now I think I'm starting to like it lower like it is. And the more I look at it the more I LOVE the poofed sleeves! 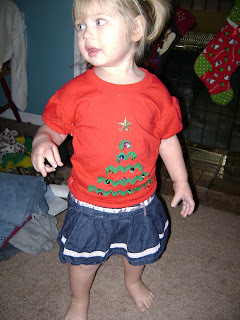 Maddy really did like her shirt, after the initial fight to get her to try it on. While making this shirt, I didnt have any (willing) model and didnt even have a shirt that actually fit her since I had just finished washing and putting away all the laundry when I put her down for her nap. It ended up being a little too narrow through the trunk, but seeing as she has less than 2 weeks left to wear it, I think it'll be fine. I am a TERRIBLE hand sewer, so thats probably why the sequins came off so easily; they weren't very secure so I'm glad I didnt make one for John or he would have eaten them! 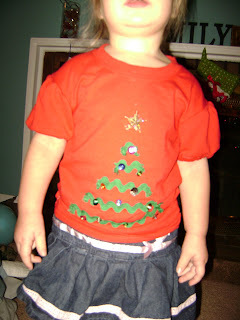 And, contrary to what it looks like in the pictures, the shirt IS a Christmas red, not a red orange. My sister turned the flash on my camera on and I cant figure out how to turn it off so they all turn out a little odd. This next week I plan to make a Christmas shirt for John, if it turns out I'll make sure to post it!